Picture uploaded by infomagnet on Apr 30, 2012. 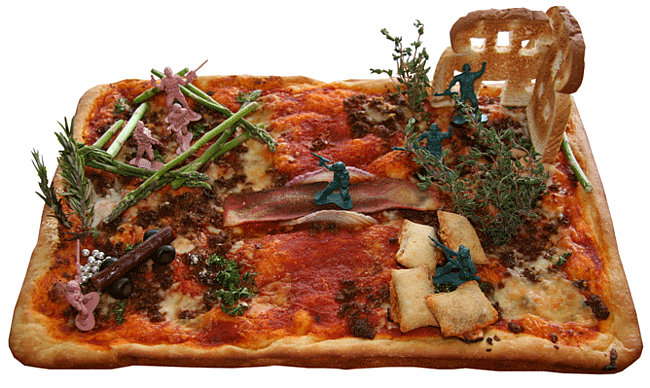 War and Pizza - based on "War and Peace" by Leo Tolstoy. This pizza was used to create the poster for the First Annual Edible Books Festival at the University of Miami Libraries in 2010. It features burnt toast ruins, fakin' bacon & onion bridge, pizza roll bunker, soy crumbles dirt, jerky & olive cannon with dragee cannon balls, rosemary & thyme foliage, and an asparagus corral.